This is a simple little salad, or side dish, that goes with a lot of other foods. I loved it beside beef and roasted potatoes, but there's many ways this could work. Maybe as part of a buffet? 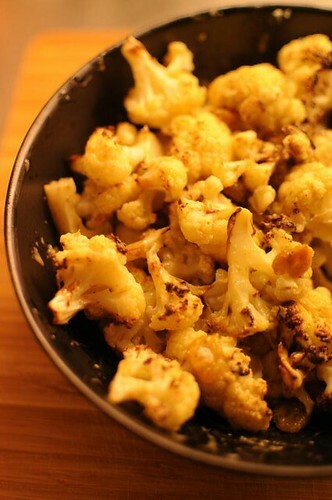 Cut the cauliflower into florets, and toss with a little bit of olive oil. Roast at 200°C for about 20 minutes, until softened. Finely chop the capers and garlic, and whisk with the red wine vinegar and olive oil. Toss with the cauliflower and the raisins. It'll be quite salty, from the capers, so you might not need to add much more salt. But by all means, season to taste. Sounds delicious. I might even persuade my cauliflower-hating other half to eat this! Thanks, Anne. I would never have thought to add capers and golden raisins to a cauliflower dish. Lately, I have been looking for new ways to eat vegetables. This seems like the perfect recipe to try!